Product prices and availability are accurate as of 2019-04-18 15:16:13 UTC and are subject to change. Any price and availability information displayed on http://www.amazon.com/ at the time of purchase will apply to the purchase of this product. Miss your morning cereal? Not anymore! Our Apple Pie Paleo Krunch option is a delicious, lightly sweet blend of dried apples, raw seeds and nuts, coconut, and a touch of honey. It can be eaten as a cereal or as a snack straight from the tub, can be enjoyed with berries and coconut milk, or you can freeze it for an extra-chilly treat! This is the perfect gluten-free, grain-free, healthy anytime treat! Comes in re-sealable and re-usable containers, with 5 servings per container. A perfect blend of nuts, apples and warm spices. Just like mom's apple pie - without the guilt! 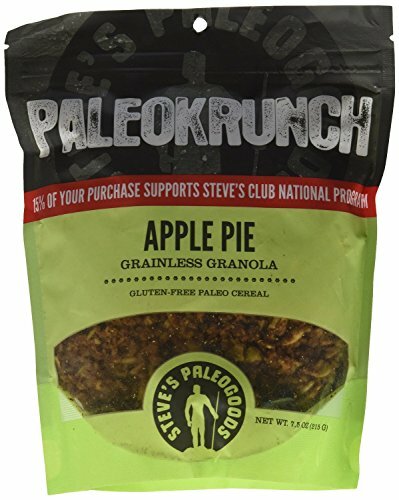 This gluten-free, grain-free granola has "Krunchy" clusters made from a delicious blend of dried apples, coconut, nuts, seeds, and honey. Use it as a breakfast with unsweetened almond or coconut milk or just as a healthy snack. The proceeds of each sale are used to fund the Steve's Club National Program. Thanks for your support!